It’s easy to get into a salad rut when summer is doing its thing in the garden and salad-making is so easy. Greens, veggies, vinaigrette, boom, salad. But a salad can be so much more, and just a few moments of effort invested in a good dressing can go a long way toward spicing things up. In celebration of salad season, here are a few of my favorite salad dressings from this year, along with a simple honey-mustard combination I’ve been enjoying lately. Cumin Vinaigrette from this Orange-Roasted Carrot and Avocado Salad, also great on any crunchy salad with Mexican food. Creamy (and, incidentally, oil-free) Cilantro and Sweet Corn Dressing from this Quinoa Salad with Radishes, Peas, Arugula. Lemon Vinaigrette, showcased here with romaine and homemade garlic croutons. And of course you can never go wrong just adding some chopped anchovy to your standard vinaigrette for any number of variations on Salade Nicoise. And, finally, my new darling, Honey Mustard Salad Dressing: Combine equal parts honey, dijon mustard, apple cider vinegar, and olive oil. Whisk until smooth. What is your favorite homemade salad dressing this summer? This entry was posted in Food, Recipes, Salads, Sauces and tagged honey mustard, salad, salad dressing recipes, spice it up, summer salads, vinaigrette on August 2, 2012 by emmycooks. A favorite that I haven’t made in a while but is really good on salads with an Asian theme: 2 Tbsp rice vinegar, 3 Tbsp Japanese soy sauce, 1 Tbsp sesame oil, 1 Tbsp canola or sunflower oil, 1/2 red chile pepper (with or without seeds, depending on how hot you’d like it to be), in the blender to really mix in the chile. Another well-known word that has been derived from salt is “salary”. In Roman times, salt was expensive and “salarium” meant a soldier’s allowance to purchase salt. It was already known that food was quite bland without it! Of course–share the salad love! Emmy gives us all some dressing inspiration here. I love balsamic vinegar. I splurged on some better quality balsamic (not the bank-breaking stuff, but better than the grocery store). I like just a drizzle of that and a drizzle of olive oil. This summer, when I have branched out beyond oil and vinegar only, I have used olive oil, lemon juice and zest, salt and pepper and a tiny bit of sugar. I was going for something that really let the citrus shine. Definitely time to experiment a little more. Thanks for the recipes and ideas! Yum! We got some really syrupy fig balsamic vinegar as a gift this year and it makes an amazing dressing. I don’t usually add sugar but I saw a recipe for a sweet onion dressing that I’m going to try this week! Got to have a good arsenal of dressings during the summer. 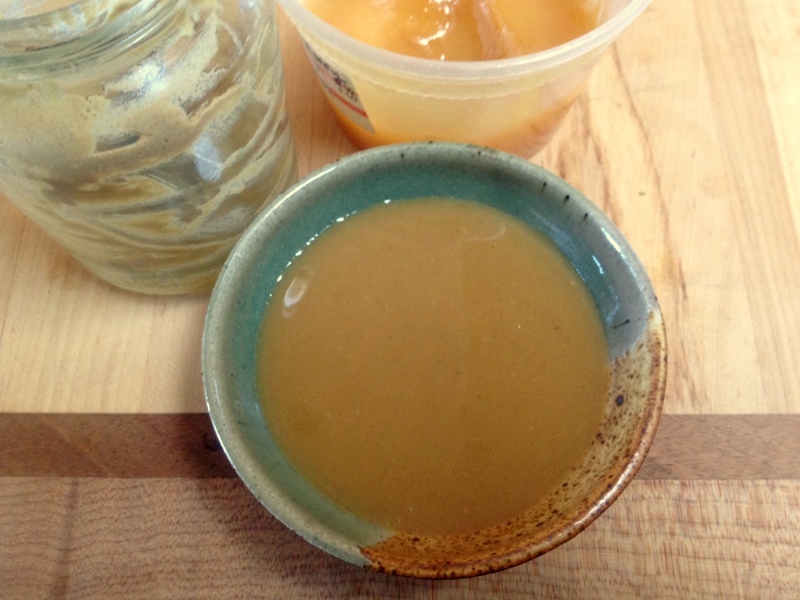 I tend to get into the vinaigrette rut. The cilantro/corn dressing sounds fantastic! I made the “milk mayonaise” with green olives discussed (gushed about) on The Splendid Table. Our kids like it, as they prefer creamy type dressings. It’s pretty light. Ok, I just learned all about “milk mayonnaise.” Interesting! Is this the recipe you’re talking about? http://www.publicradio.org/columns/splendid-table/recipes/portuguese_green_olive_dip.html Do you thin it with milk to make a salad dressing? I don’t see how you could go wrong with the olive oil, anchovies, and green olives. It is easy to get in a rut when making salads…we all have our favorite dressing. My husband would really like your honey mustard dressing. Isn’t that funny? Honey mustard completely slipped off my radar of possibilities. I’ve been steeped in balsamic for a couple of years now, and honey mustard would be a lovely shake-up. Might get a few more veggies in the little people as well. Thanks! Your one looks fab Emmy! It’s great to have a few simple vinaigrettes in your repertoire to liven up salads. I have a standard oil/vinegar/mustard one (a higher proportion of vinegar than you usually see, because I like it on the tart side). I always use extra virgin olive oil but vary the vinegar (sometimes lemon juice) and spices and herbs for extra flavour. So easy to make and so much better than something from a bottle! Love your idea of adding honey; I’m going to try that! This couldn’t have come at a better time. I was saying to a friend I’m so lazy when it comes to dressing salads. My hubby likes his salad naked. So most if the time I end up reaching for the white balsamic and splashing that over the top of our salad. Mmm honey mustard. Yum!